Dr. Chadkewicz provides high-tech digital diagnostic tools for advanced dental care. (PRLEAP.COM) December 16, 2014 - San Diego, California – Dr. Vivien Chadkewicz is excited to share digital technology, such as magnifying glasses and computerized anesthetic, with patients who visit her Sorrento Valley dental office. Dr. Chadkewicz, owner and operator of Vivien Chadkewicz, DMD, uses innovative devices like digital x-rays, intraoral camera imaging, computerized administration of anesthetic, and Loupes magnifying glasses to create more comprehensive examinations for patients. "My goal has always been to provide the highest quality care for my patients," says Dr. Chadkewicz. "By housing some of the latest digital technology for dentists, I am able to help my patients achieve the smile they have always wanted." Digital x-rays and intraoral camera imaging have made preventive dental care more efficient by creating a way to digitally enhance and transfer images. The technology allows Dr. Chadkewicz to make a more accurate and detailed diagnosis for concise dental care. Magnifying devices like Loupes allow Dr. Chadkewicz to hone in on potential oral health concerns before they develop into serious issues, and computerized anesthetic has created a administration system that virtually eliminates the pain and anxiety associated with anesthetic injections. "We are very excited about the implementation of Loupes and the computerized anesthetic system because now we can significantly improve patient comfort while also preventing dental problems for patients in our area." explains Dr. Chadkewicz. Dr. Chadkewicz has been practicing dentistry since 1989 and has been located in California since 2001. 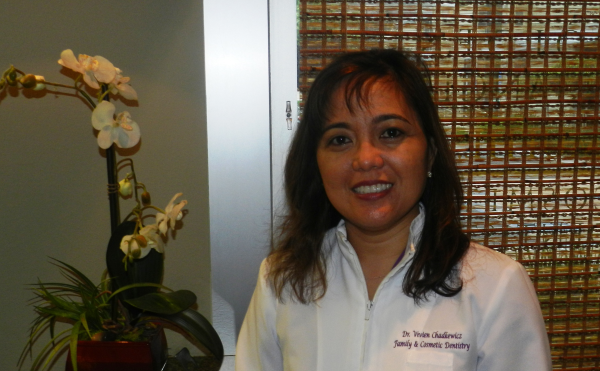 Although she has not always practiced in San Diego, her goal in dentistry has never changed – to provide the best quality dental care to all of her patients in a caring and friendly environment. Dr. Chadkewicz is a family dentist who provides expert dental care for both children and adults. She also provides cosmetic dentistry and dental restoration services for patients looking to improve the appearance and health of their smile. For more information about Dr. Chadkewicz and her practice, visit rbdrchad.com.